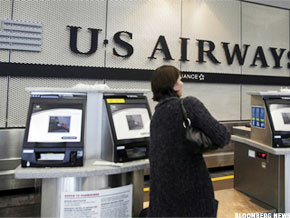 US Airways will likely end up in a merger with a Big Three carrier, says the carrier's president. CHARLOTTE, N.C. ( TheStreet) -- A merger between US Airways ( LCC and one of the Big Three airlines "is a pretty high probability for the end game" of major airline consolidation, while the chance of merging with a smaller carrier is near zero, said US Airways president Scott Kirby at a May 27 meeting with pilots in Charlotte. "Further down the road, there's a high probability that US Airways will wind up merging with either United ( UAUA, Delta ( DAL or American ( AMR," said Kirby. The rationale, he said, is that if regulators approve the planned merger between United and Continental, the combined carrier would have a 22% share of the domestic market -- the same percentage that Delta currently holds, while American has an 18% share. "None of those are anywhere close to dominant market shares," said Kirby. "We'll be about 8%. We could merge with any one of those three. At most, you take Delta or United up to 30%. That still leaves a very competitive vibrant industry and one of the industries that's most competitive today." As for a merger with a smaller carrier or a low-cost carrier, Kirby ticked off the reasons why it won't happen. Regarding JetBlue ( JBLU, he said: " It is profitable today or works today because they have much lower costs than us, which is mostly a seniority issue. Put our cost structure on JetBlue and they lose a ton of money." Meanwhile, AirTran ( AAI "has a pricing umbrella versus Delta," meaning that Delta does not match every fare, "but as a big airline we wouldn't have that," Kirby said. Hawaiian ( HA flies primarily in leisure markets. And "the problem with Alaska ( ALK is that their cost structure is way too high for us." Southwest ( LUV - Get Report), the largest low-fare carrier, is unlikely to merge with anyone because of the failure of its attempted 2009 merger with Frontier. At the time, Southwest said it would not do a deal without the approval of its pilots union. The pilots union "told pilots at the other airline 'we're going to staple you,'" meaning that every single Frontier pilot would fall below the lowest Southwest pilot in seniority. "The other guys are going to never agree," Kirby said. "It will be hard for Southwest to do a deal because of that, unless they change that policy." Kirby also reiterated that US Airways has no immediate need to do a deal. The economy is improving and the airline recently projected 18% to 19% in second-quarter revenue per available seat mile. If that continues, US Airways could add $2 billion in annual revenue, nearly restoring the carrier to its 2008 level. Meanwhile, baggage fees are adding $500 million annually in revenue, equivalent to the highest annual income the carrier has produced since its 2005 merger with America West. Moreover, US Airways' April operating metrics -- including on-time performance, completion rate and mishandled bags -- were at their best levels since the merger. "Things look brighter than they have in a very long time," Kirby said. US Airways shares are up about 80% this year, due to a combination of returning travel, reduced industry capacity, lower oil prices and merger speculation. During the same period, the S&P 500 Index fell by 2%. In May, US Airways shares gained 21%, while the S&P Index fell by 8%.